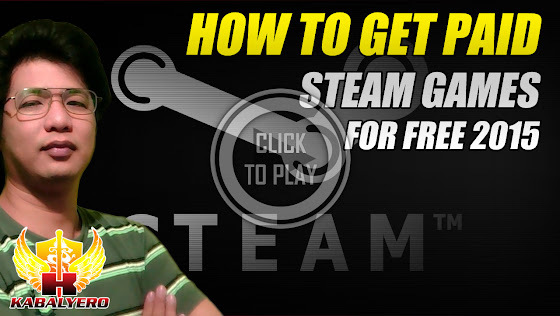 How To Get Paid STEAM Games For Free 2015 - KABALYERO - PLAY, BLOG & EARN! How to get paid STEAM games for free 2015, in this video, I'm going to share to you guys how you can get paid STEAM games for free. Now, don't hate me if it doesn't work for you. Getting free STEAM games is easy. Just go to the store section of STEAM, click on Free-To-Play and choose from the hundreds of free STEAM games available to you. Now, getting paid STEAM games for free is a little bit different because they are not actually free because they are paid games and, that means, you have to pay for them to get them. In this video, I'm going to share to you how to get paid STEAM games for free and this method will only work for those of you who are STEAM users that have their own YouTube channel. If you are a STEAM user and you have your own YouTube channel then the first thing you need to do is become a YouTube partner under the Freedom! Network. As soon as you become a YouTube partner under the Freedom! Network, the next thing you need to do is login to your Freedom! Network Dashboard. In your Freedom! Network Dashboard, look for and click Sponsorship Reviews. This will open the Reviews page where you will see a list of available titles for review. Some of these titles are paid STEAM games. Just click on the paid STEAM game that you like, claim the STEAM code for that game, activate the STEAM code in STEAM and enjoy playing your paid STEAM game for free. Now, this is just one way of getting paid STEAM games for free and if you are interested in this method and you have a YouTube channel then become a YouTube partner by joining the Freedom! Network.